At Monday night’s Richmond Neighborhood Coordinating Council meeting – which draws representatives from dozens of enclaves from all over the city – it was arguably Richmond’s most maligned community that had the honor of having two competing factions vying to represent it. It was North Richmond. The little neighborhood that has historically suffered from a lack of leadership was suddenly over-represented. It was a dubious honor. Both sides were seated up front in the City Hall-complex meeting room, and neither looked happy. The confrontation that would boil over Monday was an extension of the continued disunity of political forces in North Richmond, a tiny enclave split with arbitrary boundaries dividing the city of Richmond and unincorporated Contra Costa County land. Marena Brown, a regular attendee of the citywide meetings, sat on one side, wearing a sharp gray pantsuit and a look of edgy concern. A few feet away sat Saleem Bey and Rev. Kenneth Davis, two neighborhood activists who have a reputation for fiery confrontations with local elected officials. Uncharacteristically, both wore conservative, monochromatic suits and looks of relaxed ease. Both Brown and the tandem of Bey and Davis claimed to be the same thing: The leaders of the Shields-Reid Neighborhood Council representing North Richmond. Brown gave her report first. Her group was planning a march for peace this fall. Moments later, Bey gave his report of community events and services, and announced himself as president of Brown’s council, as decided by a certified election held Aug. 17. A few scoffs were audible. Someone interrupted. The meeting adjourned for a snack break. That’s when uneasy calm broke once and for all. “What is this?” Brown asked Bea Roberson, the RNCC president. Bey hovered near. Brown turned to him. “We had our neighborhood council …” Bey began before tailing off. Brown walked away, out the door and toward the parking lot. She declined comment. When the meeting resumed, her seat was empty. Bey went on to note that his group has been meeting for years at Shields-Reid Community Center, while Brown’s meets at the Community Housing Development Corporation’s headquarters a few blocks away. Roberson said the situation was unfortunate, but rules are rules. 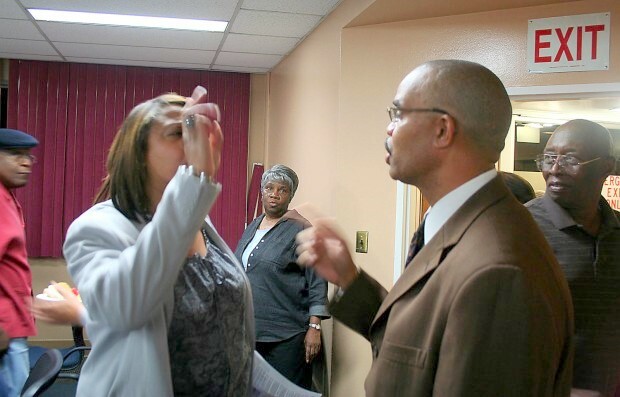 The confrontation Monday was the latest episode in a simmering feud involving local activists and dueling county and city elected officials. Bey and Davis have been locked in a bitter contest with County Supervisor John Gioia, unincorporated North Richmond’s de facto elected official. Gioia has accused Bey of trying to intimidate public officials into giving him money, a charge Brown echoed Monday night. But why is North Richmond, the Bay Area’s poorest community, suddenly the venue for a power struggle? Part of the answer may lay in a pot of relatively new monies, some residents and observers grumble. In 2006, Gioia led an effort to impose a free on tonnage processed through the nearby West Contra Costa Sanitary Landfill station. The money amounts to about $600,000 annually, and its expenditure is directed by a committee that includes three Richmond City Council members, three community members, and Gioia. Currently, at least half of the money goes to subsidize additional Sheriffs patrols, an allocation Gioia supports, but Bey and Davis do not. Leadership on the neighborhood council could be a key position from which to exert influence over the mitigation fund. Gioia on Wednesday tried to stay above the fray. Davis and Bey have called Brown “Gioia’s candidate,” a connection Gioia has denied. But Bey and Davis have their allies too. On Aug. 17, Richmond Mayor Gayle McLaughlin attended the neighborhood meeting led by Bey and Davis, and according to both men was adamantly in support of their legitimacy as leaders of the organization. McLaughlin and Gioia have had a cool relationship in the past. Gioia has supported McLaughlin’s political opponents, most recently former Mayor Irma Anderson. Gioia has never endorsed McLaughlin, who has run and won two campaigns for Richmond’s highest office. Gioia has declined further comment on Monday’s flap. McLaughlin did not respond to requests for comment Tuesday. As for what’s next, it’s anybody’s guess. At next month’s meeting, there may be more testiness. Bey and Davis, both known as not being shy with expressing their opinions, will likely have a seat at the table at least until their dues are up in December, Roberson said. A board meeting is scheduled for Monday, and Brown contacted Roberson Tuesday to express interest in attending and perhaps working toward a solution. Meanwhile, the president and vice president of the Neighborhood Council in a neighborhood that is mostly in the county are clearly allied with Richmond’s mayor, and have a toxic relationship with county government. “According to the rules, they’re it,” Roberson said, shrugging her shoulders.